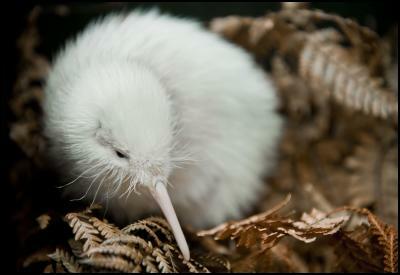 We are delighted to let you be the first to know of the hatching of a white kiwi chick at Pukaha. As far as we know this is the first hatched in captivity and definitely the first hatched at Pukaha. This exciting event marks the end of the most successful kiwi breeding season in Pukaha’s history with a total of 14 chicks hatched. The all-white chick is not an albino but the rare offspring off kiwi that were transferred from Little Barrier Island to Pukaha in May last year. The intention of the transfer was to increase the kiwi gene pool and grow the population in the long-term so we are delighted with this great result. The chick is a North Island Brown kiwi that is white. Local iwi and Pukaha Mount Bruce partner, Rangitane o Wairarapa, has named the chick Manukura which means chiefly status. Rangitane chief executive and Pukaha board member, Jason Kerehi, said tribal elders saw the white chick as a tohu or a sign of new beginnings. Manukura will be in the kiwi nursery until the end of May where you may view it being weighed daily at 2.00pm. It will remain in captivity with our other chicks for at least four to six months and there will be the opportunity to for regular viewings while it is being cared for. The health and safety of this very special chick is our priority. Please feel free to phone ahead to make sure it is available. We would love to see you.